Earlier today, I asked the MobyGames admins to completely obliterate an entry that I entered a long time ago when I was new to the database. I realized there were a bunch of things wrong with it and it was easier to perform a summary “do-over” than submit a series of corrections. The game was entitled Space Racers, or I thought it was. 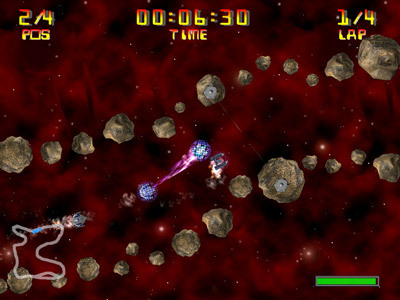 In-game, the title was Rocky Racers. This game is another one of those credit card form factor mini-CDs published by Selectsoft as “Pocketware”. Now that I realize that they like to gratuitously rename games, I need to change the title, the publisher, the description, the release date, everything. I played Rocky Racers again tonight. And since that was quick enough, I picked out another random game from the pile: Kombat Kars. The company name on this one sounded familiar: Positech, same company that did Rocky Racers. Guess what? Kombat Kars is essentially the same game with slightly different art and music! In fact, the brief credits screens for each game are exactly the same (one guy doing programming and graphics, outsourced music, and 3 playtesters; I pity that trio, more on why in a moment). Rocky Racers, a.k.a. 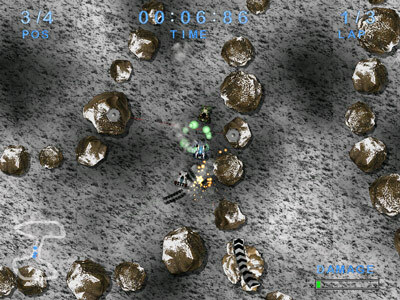 Space Racers, involves 4 outer space ships racing around an asteroid-delimited 2D race course. Multiplayer is possible via TCP/IP or IPX, or the balance of ships is controlled, rather ruthlessly, by the computer. Any of the ships has the capacity to fire on other ships or activate a tractor beam in an effort to slow their progress. It’s also possible to work your way outside of the asteroid boundaries. However, there are a number of waypoints that you are expected to cross and if you miss any, the game will complain and presumably disqualify you from winning. Not that I would know for sure. The controls are very difficult to use. Or maybe the ships are too quick, or the track is too confined. I found it all very difficult. The other ships fought ahead of me in short order and got way out ahead of me while I was still constantly bouncing off the game’s eponymous rocks. I didn’t get far. Those 3 playtesters must have been a patient bunch. Kombat Kars has cars instead of spaceships and, while apparently published a bit later than Rocky Racers, isn’t quite as involved. There is one less track (8 vs. 9), no multiplayer support, and no tractor beam, though that last feature might not make as much sense in context. I found it just as frustrating to play. These 2 are such pretty games and should make for awesome casual distractions. I really wish they had joystick support as that probably would have made gameplay easier. This is the person to blame for these 2 games. He still appears to be gainfully employed in the same field.